Back in the 1960’s the undead crawled their way into pop culture thanks to George A. Romero’s Night of the Living Dead. Ever since they gnawed their way into our hearts we just can’t let them go. There are books exploring creation myths and offering survival tips, movies about how zombies have destroyed civilization or how we finally conquered the disease. You can even find shows exploring what it would be like to be a sentient zombie with feelings and relationships. We find zombies as the theme in films, books, videogames, and board games; just check out our review of Zombie Kids! Our obsession with zombies is here to stay and I’m not complaining. But that does mean that a new zombie themed game faces tough competition as it tries to stand out in a crowded market of undead. In today’s review we find ourselves preparing weapons, gathering supplies, and trying to complete our missions before the zombie horde takes over the mall. Let’s chow down on this review of Tiny Epic Zombies. 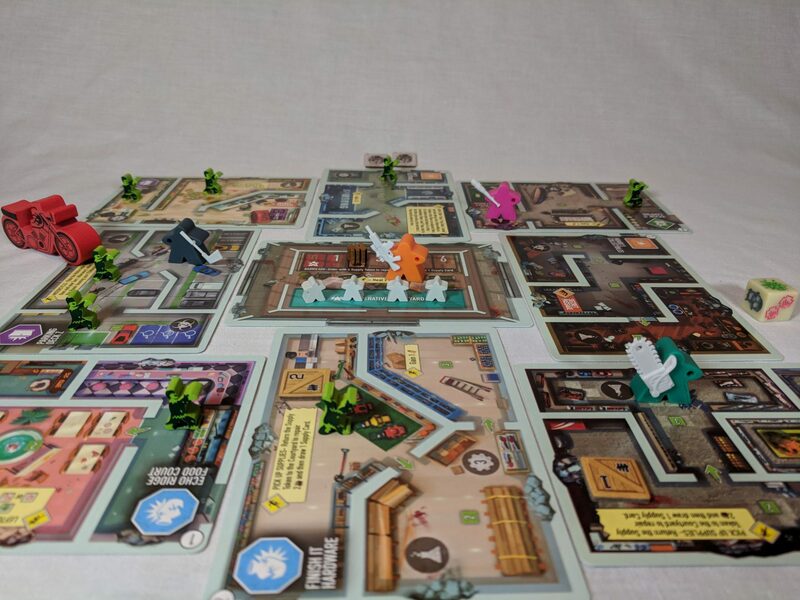 Tiny Epic Zombies (TEZ) is a fast paced survival game. It’s a game of board management and turn efficiency. You play either a human or a zombie. If you’re a human then you want to complete the 3 missions as soon as possible. If you’re a zombie your goal is to kill the survivors the humans are protecting, or outlast them until their supplies run out. It’s a very familiar concept. You may have seen it in…any zombie themed thing ever. The game takes place in a mall that has been devastated by the zombies. In the middle is the courtyard which is your safe space; one which the zombies are trying to attack. It is protected by a barricade that you can increase in strength throughout the game. The mall around the courtyard is made up of 8 double-sided cards, or stores, randomly placed, which makes the game different in every setup. The sides have different art but the special events and abilities gained from the rooms in each store aren’t really all that different. Humans have special abilities that break the normal rules, so make sure you’re using your abilities to their fullest: abilities like extra movement, reduced bullet cost, or looking through the supply deck. On your turn you must move 3 times and then you must attack a zombie in your room, or you may attack one in an adjacent room. When you attack a zombie in your room, roll the attack die and remove the zombie. The zombies are always killed but you might have been hurt during the fight and the attack die lets you know if that happened. If you attack a zombie in an adjacent room lower your bullet count by one and remove the zombie. Weapons you collect and use will break those rules or give you special abilities. After you kill a zombie you may then use the room’s ability or interact with a mission token. Then, if the whole store is empty, you can collect any supply cards in the room. The trick in this game is to keep moving. The zombies are weak and slow but they’re aren’t going to let you sit around. All they want to do is eat your brains. After each player takes a turn, it’s time for the zombie rush. In game terms it’s called “check for noise”. The zombie has a search deck and has played cards face down on each player. After each player finishes their turn they flip that card over and place it next to the store where they ended their turn. 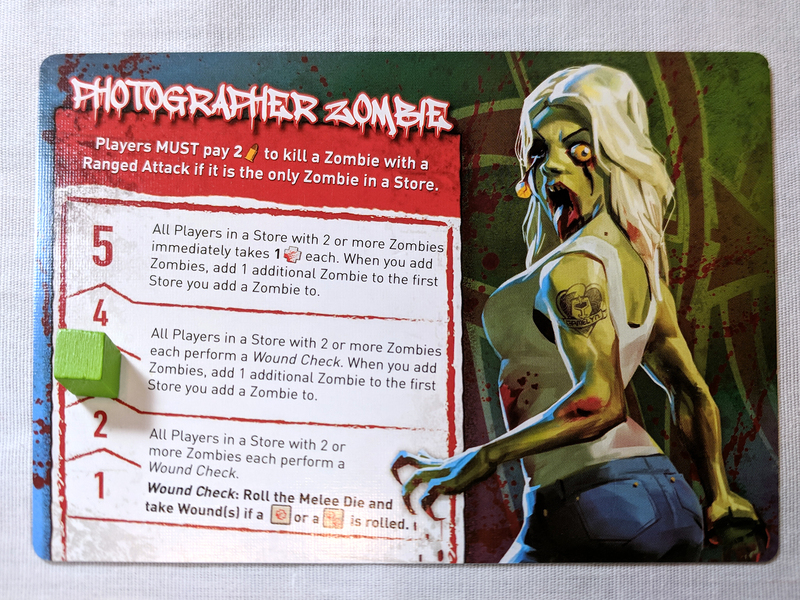 The zombie player then checks to see if the symbol on the card revealed matches the symbol on the room in which it was placed. If they do not match then that means the human player did not make noise and the zombie player places 2 zombie figures in stores with a matching symbol. If the symbols match that means the human player made noise and the zombie player gets to use the power on one of their zombies cards (they may have collected multiple if they have killed humans) and then increase its level once. The zombies all have unique and powerful passive abilities that make it more difficult for humans to survive. Abilities like taking more bullets to kill, breaking the rules of zombie placement, placing more zombies, or giving more damage to humans. The active abilities are more powerful and much more harmful and troublesome to the humans. As a zombie you’re able to do things like take items or mission objectives away from players, cause direct harm, make mission progress more difficult, or move zombies through rooms. What is unique about TEZ is that it can be played 5 different ways! Team vs. One Cooperative, Team vs. Game Cooperative, Free for All vs. One Competitive, Free for All vs. Game Competitive, and Solo. The “One” is the zombie player. “Cooperative” is where all the humans are working together to complete all three missions. The “Free for All” means the human players are racing to finish the three missions first. If you want a very difficult challenge as a human player go for Free for All vs. One Competitive. Competing with other players while trying to manage the zombie population that is being controlled by another player will really make the game difficult. Keep in mind there is no direct player conflict, it’s just a race to complete the missions first. The AI, while handled well, follows a strict set of rules. However, with a real player controlling the zombies, they will play more strategically and can intentionally target specific players. These are things that will make the Free for All vs. One Competitive very challenging. I am unashamedly a big fan of Gamelyn Games and Scott Almes. You can tell by my reviews of Tiny Epic Quest and Heroes of Land, Air & Sea. The Tiny Epic series is easy to pick up and play in an hour and they aren’t hard to teach. The rules are simple and turns move quickly. The most popular and a fan favorite in the line is Tiny Epic Galaxies. It’s easy to get on the table and clean up. TEZ is a bigger game with more pieces but still the same size box. This could be a deterrent for those who love some of the previous games because of their manageable piece count. 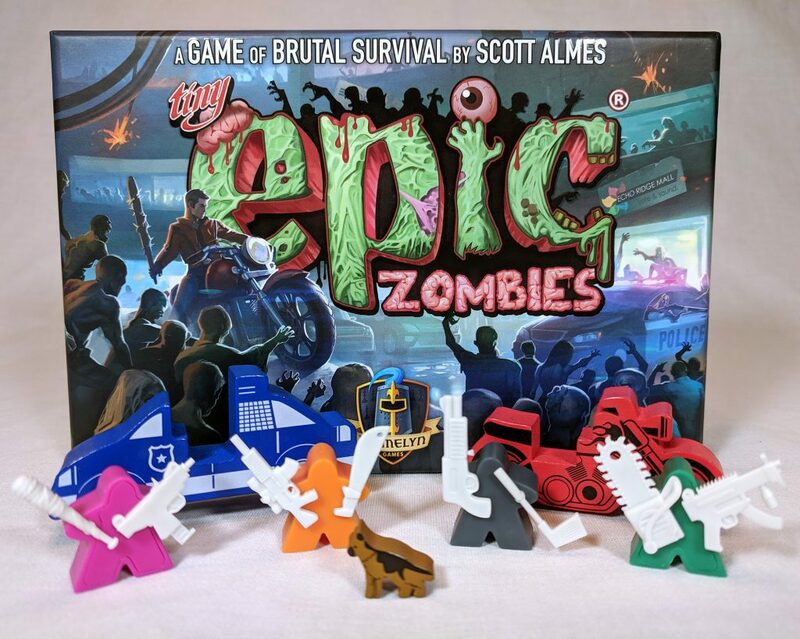 Tiny Epic Zombies continues the use of ITEMeeples (read Item Meeples). I’m a fan of the ITEMeeples, which Gamelyn originally revealed in their game Tiny Epic Quest. It’s a really neat idea and adds some pop to the table presence of the game (and if you paint them…oh, man!). Meeples holding weapons? Even though I love it, I still think its a gimmick. What they add to the game is purely cosmetic, and increases the piece count. They can be a bit annoying because there are so many other things to set up and put away; e.g. there a lot of mission tokens and you use a few each game. 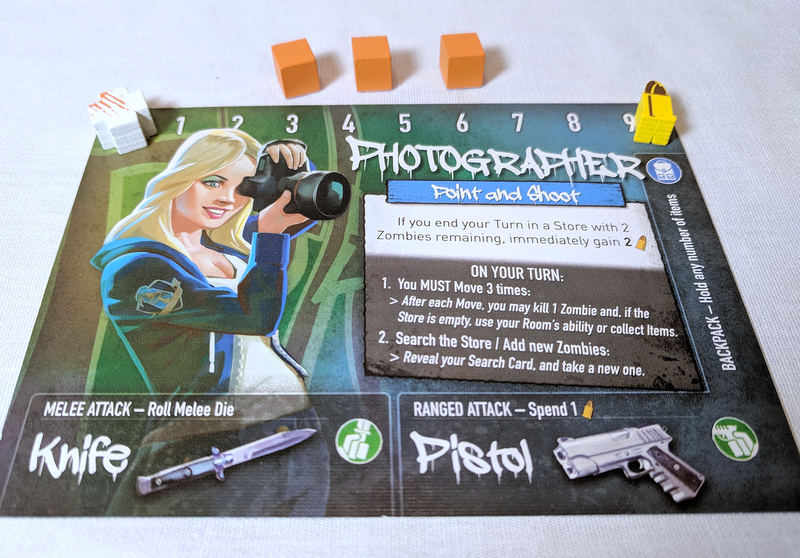 There are a lot of small pieces to this game, including these weapons: zombies, player ITEMeeples, mission tokens, player cubes, store tokens, survivor meeples, the barricade, the motorcycle, and police car. I will admit, I’m impressed they all fit into the box, but with all the small pieces, and special setup rules for the mission cards, it can be a bit tedious. Once things get going they move pretty fast. As a player you have to manage zombie count and make your turns efficient because there’s only so much time before your supplies run out. The zombie player has a search deck they draw from. When that deck runs out and then those cards have been revealed each human player gets one more turn. It can be nice to have a built in timer in a game. You know you’ve got to focus on your missions and make your turns count. 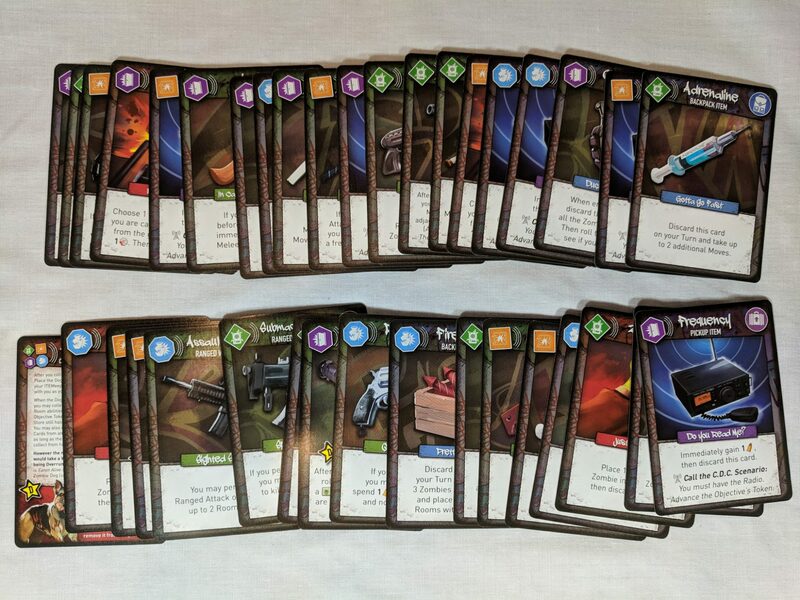 The search deck only has 24 cards so the maximum number of turns (total, not per player) is 24 plus player count. It adds tension and builds suspense, which is very appropriate for this game. The move and attack mechanic seemed difficult for people to grasp at first. Most people have experienced “You take 3 actions from a list of 5…” or some such. However TEZ is different in that you MUST move 3 times and you attack after each move. It gives the feeling of always being on the run, dodging and ducking zombies, and quickly taking them down on your way through the mall. It feels good to mow down 3 (or more!) zombies on your turn but is that the wisest use of your time? There are a lot of things to balance during the game and, depending on the play mode, it could be easy to get overrun. 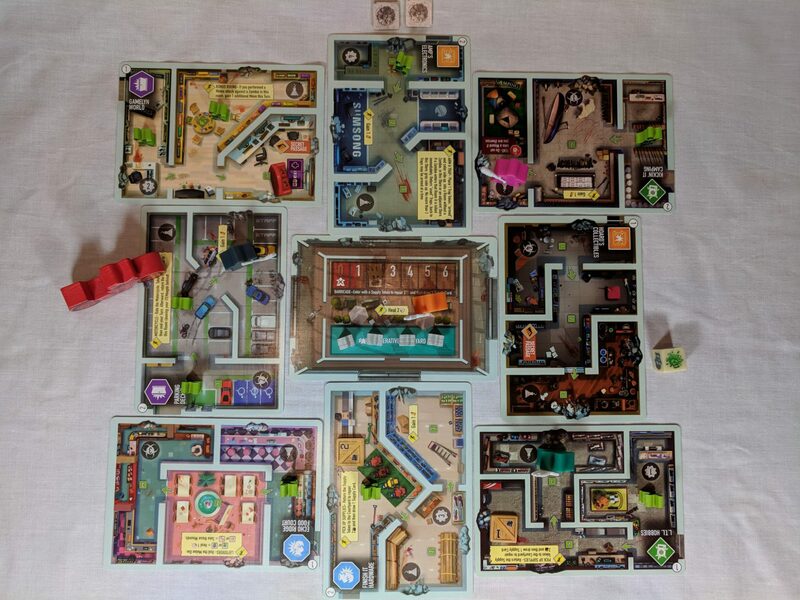 Tiny Epic Zombies has a bit more setup than I would have liked. There are a lot of pieces to organize and cards to shuffle into the correct decks. The gameplay is a lot of fun and I would highly recommend playing Team vs One/Game Cooperative or Solo. In the competitive versions, when the zombie wins, players might feel like they didn’t really have a chance. It’s a tough balance of working together to manage the zombies but also completing the 3 missions before the other human players. It can be frustrating but if you like that kind of challenge, go for it! I’ve played it many times since I received it and with different types of gamers. After each game, whether win or lose, there was a lot of excited discussion about making better plans next time. 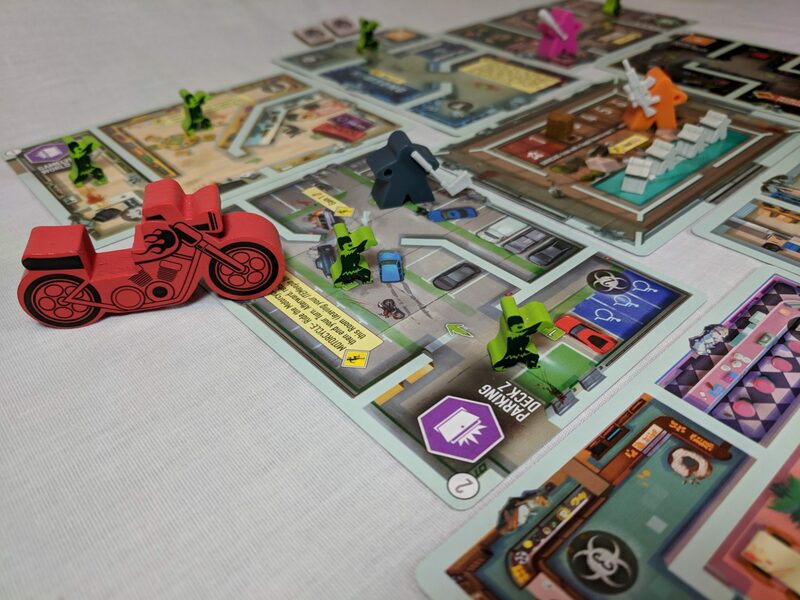 The ever encroaching zombies, the ticking timer of the supply deck, and trying to make turns efficient really help ramp up the suspense and horror of this game which helps it race to the front of the horde of many other zombie themed games. The varying play modes, the randomization of the board and character cards, and unique weapons increase the replayability tremendously. 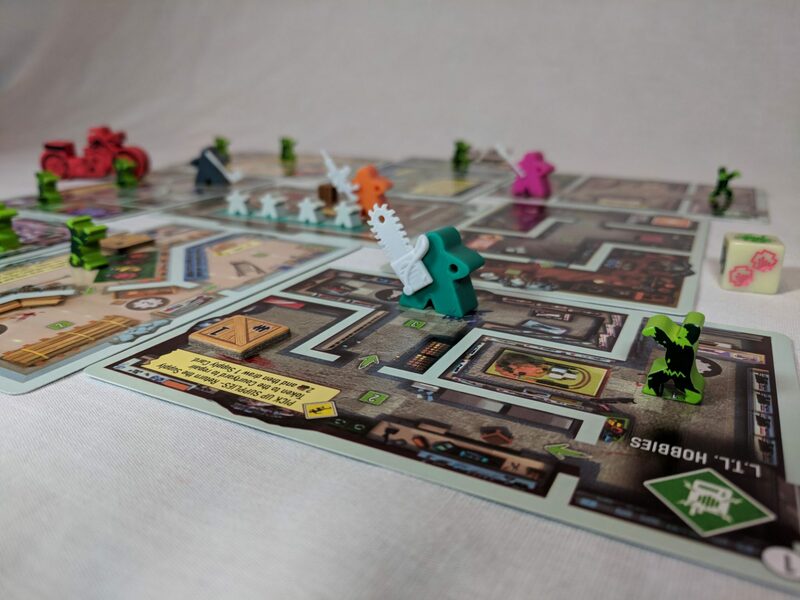 Tiny Epic Zombies sits at a very accessible price point which is very attractive when deciding on whether or not to add a game to your shelf. This is one of the biggest selling points to the Tiny Epic series. Ultimately, I’d say run, don’t shamble, to the store and grab a copy for your table! The genre has come a long way from Zombies!, this looks awesome! I definitely want to check this one out. I’m bummed I missed the KS! Love that we are using gleam! Great article all around! I’ve not been too interested in the Tiny Epic games so far, but this one looks great. It’s a theme I can get into, and the weapon carrying meeples look awesome. Excellent and informative review. I already wanted it but now I want it more! I actually love games with lots of little bits if it enhances the theme which in this case I think even the unnecessary bits do. All the descriptions of the difference game play modes make is sound super fun, challenging, and of course what all zombie games should feel like, TENSE! 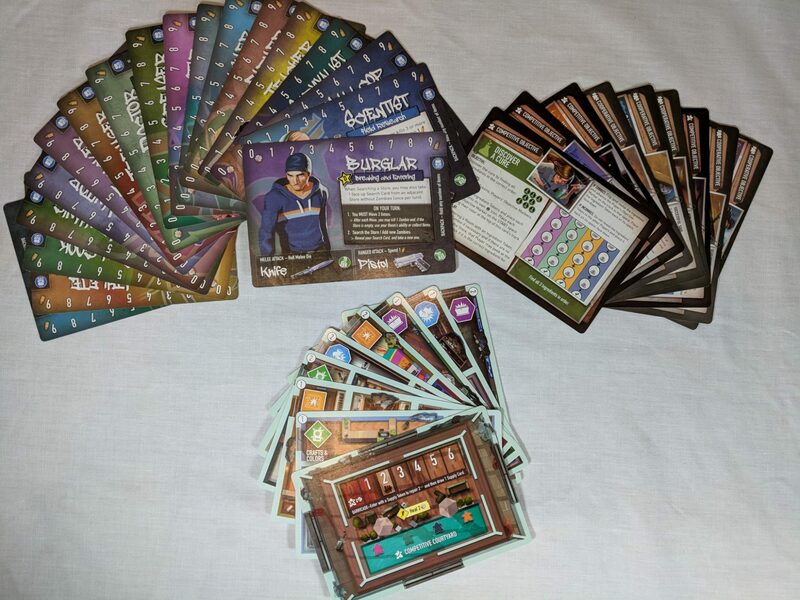 I’m a big fan of Gamelyn Games, thanks for the review and contest! Wow, excellent detailed review! Thanks. I have really been enjoying the work you guys do. Wish I were creative enough to do this! Love the info, i really wanna try this game now! I tried the print and play during the Kickstarter and was intrigued but decided to wait until retail. Definitely need to check this one out! Looks lie a good time, cant wait to get my hands on a copy! If I do not win this, I am probably going to buy it anyways. Thank you for your review! This is my first time here, I’m going to have to wonder about this site looking for more great things to read. 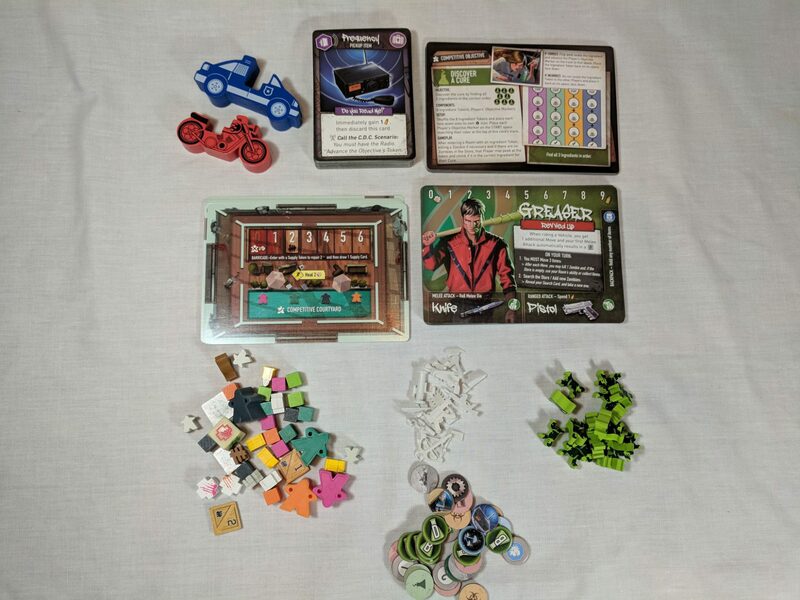 This was the Tiny Epic game which brought me into the franchise, at least as far as being interested in them, but oddly I never ended up buying it, or any of the other ones till Mechs. I think it is probably because up till then I was living near friends who owned all of them. Really want to win this one! Will probably buy it anyway! Thanks for the great review and the chance to win a copy of the game. So cool of y’all to do a giveaway, and you’re including a mat! I wish there was a “chain” weapon to use while riding around on the motorcycle. cool overview of the game! Thank you both for the review, and giving us a chance to win a copy! This one really looks and feels more epic, despite the small box. Definitely seems worth it! I have yet to play any of these Tiny games but am doing the KS for TEM. would love to add TEZ. As always, you knocked this review out of the park, Jonathan. do you think is has replayability? I was thoroughly entertained by this game after one playthrough with friends last Friday (we love Tiny Epic Defenders & its Dark War expansion). I just ordered TEZ and a mat last Sunday and it arrived today (four days later). It also inspired a re-watch of Dawn of the Dead. I do. The replayability is great because there are so many different characters to play, the different play modes, and the mall is always different with different goals and room locations.